The WWE Championship will be on the line in a handicap match at the Royal Rumble. 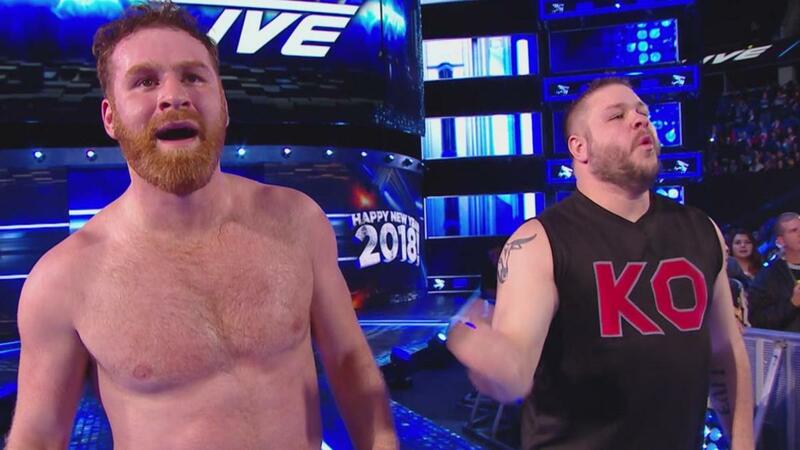 The match, which was made at the end of tonight's episode of SmackDown, will be AJ Styles defending against the team of Kevin Owens & Sami Zayn. Owens and Zayn have each pinned Styles in non-title matches over the last two weeks, with both of those wins advancing the storyline of dissension between Shane McMahon and Daniel Bryan. Owens, Shane, and Bryan were all at ringside for Styles vs. Zayn tonight. After a ref bump, Owens blocked the referee from getting back into the ring and counting a pin for Styles. Shane then pushed Owens and tried to get the referee to send him to the back, with Bryan responding that Shane should leave with Owens. Styles knocked Owens off the apron, but that allowed Zayn to hit Styles with the Helluva Kick for the win. Styles got on the microphone after. He told Shane and Bryan to stop bickering like children and said he should just face both Owens & Zayn in a handicap match. Bryan liked the idea and made the title match official.